Did you know there's a Center for Plain Language? Seriously! 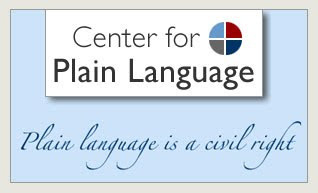 www.centerforplainlanguage.org And I find myself quite glad that someone out there is taking up this cause. Plain language is very usable, especially as they define it: "reader-focused writing" that "works well for the people who use that material." Too often, people or groups are motivated to obscure their language: fancy technobabble meant to impress colleagues, or at worst, legaleze meant to confuse and trap the reader. With plainer language, I've got to imagine that the credit and mortgage crises may have been averted. So, CPL, keep fighting the good fight! I agree. It's really astonishing how many people think that there is a benefit in making critical information hard to read. Or just don't know how much easier things would be if we didn't have to spend time and energy figuring out unnecessarily complex documents. By the way, the Center has new awards: the ClearMark celebrates the best in clear communication, while the WonderMark ("I wonder what they meant by that") highlights items that could use a lot of improvement. Everyone deserves clear language from business and especially from the government. I don't understand how the government can get away with all that bureaucratic gobbledygook. I'd think that in a democracy the government should be clear. But people just don't seem inclined to complain about unclear government writing. I think they should.